First and foremost I would like to wish my family, friends and followers a very Happy Christmas, joyful holiday and a healthy and peaceful New Year! 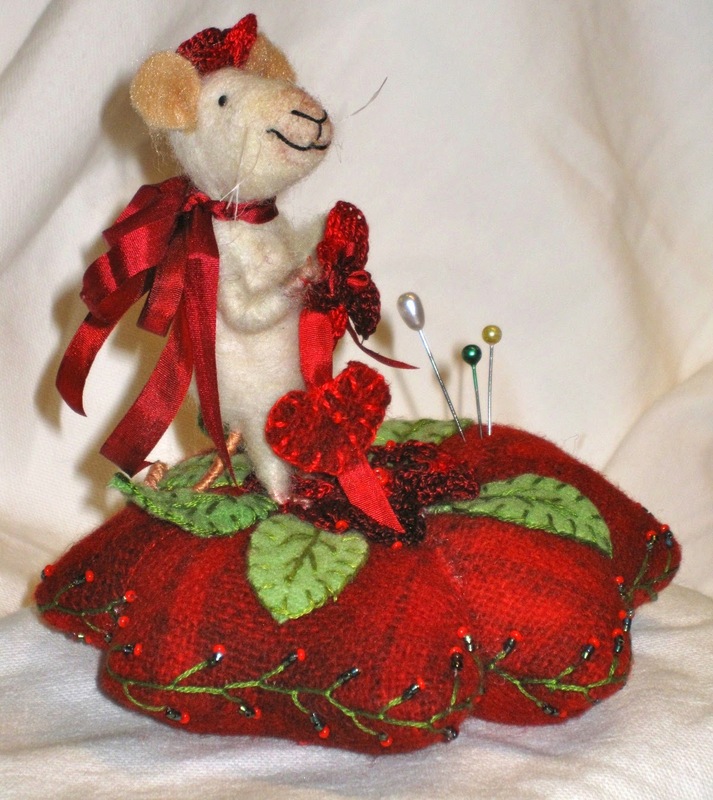 Just in time for Christmas I finished a new pincushion, a felted calico kitty that I call Calico Kate. 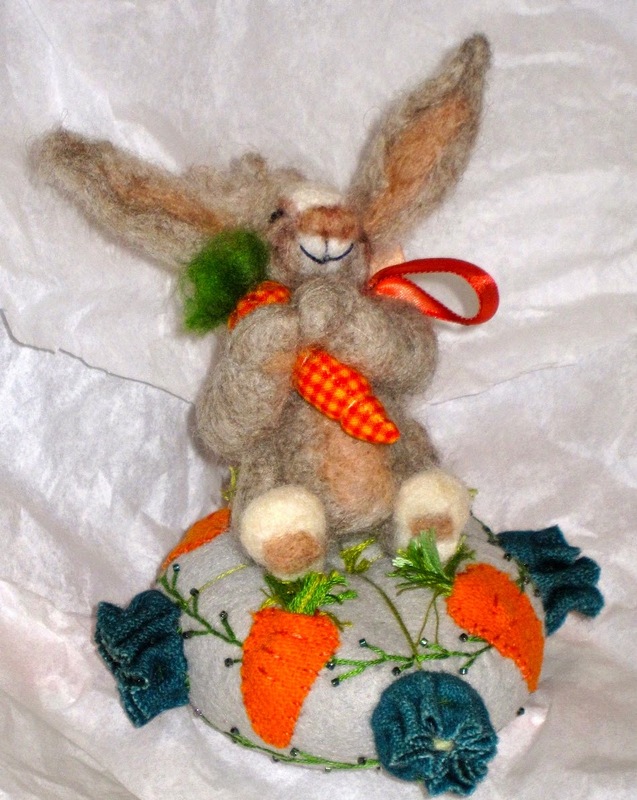 This pincushion is made with wool felt and embroidered. The kitty is all wool and needle felted. 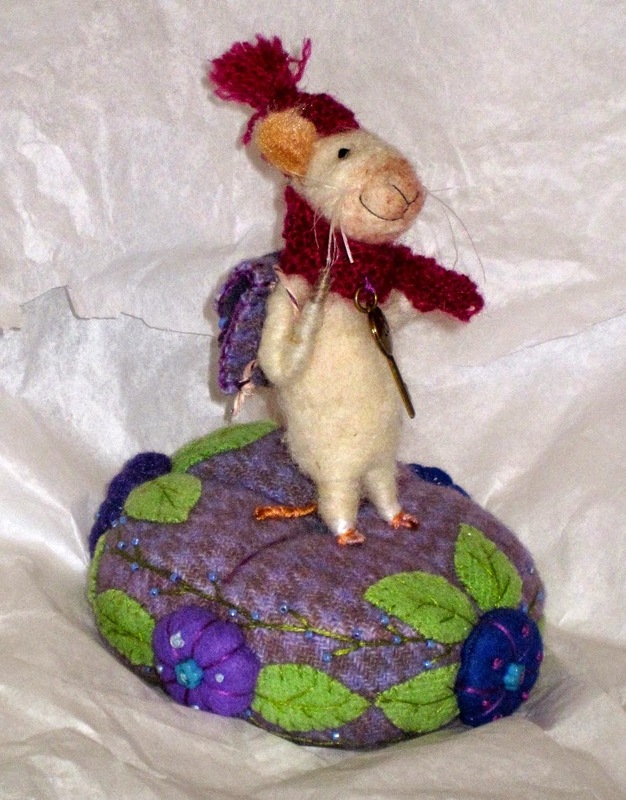 Next I made a needle felted wee mouse that is dressed in her pink finery. 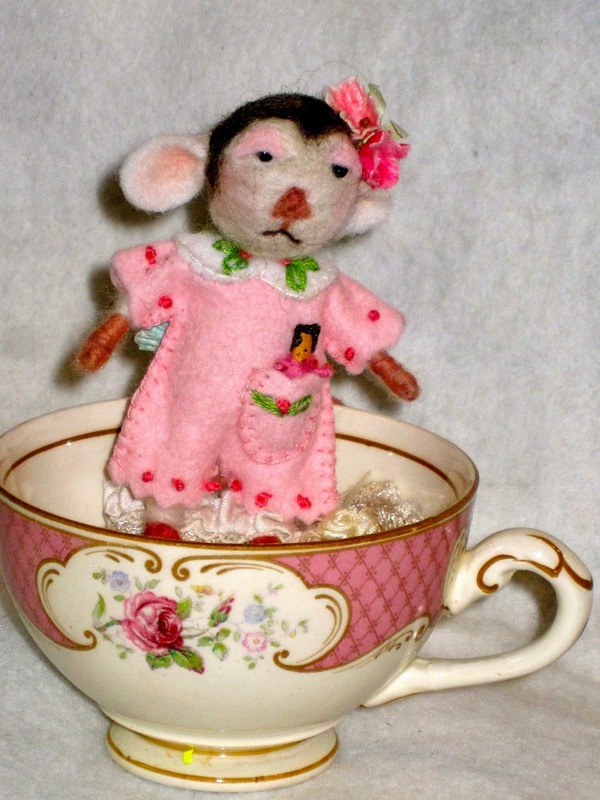 She sits in an antique teacup. Inside the teacup is a lavender sachet covered in lace! 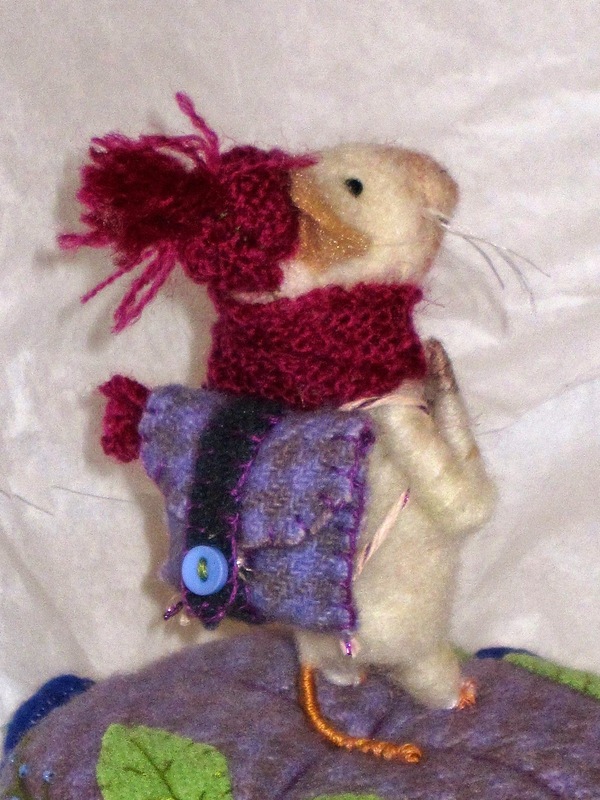 I made the mouse in an on-line class with Barby Anderson. 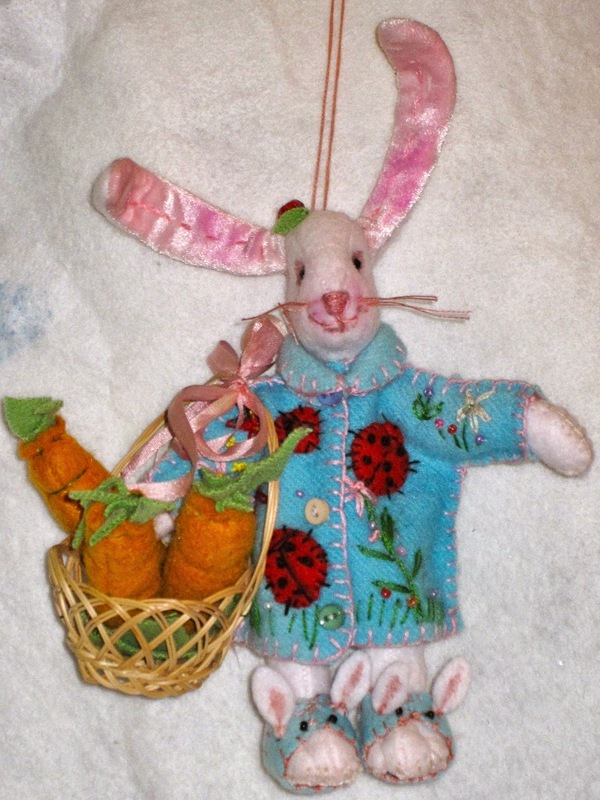 Finally, I wanted to make a very special white wool felt rabbit for a special young woman that is having a difficult time recovering from a car accident. 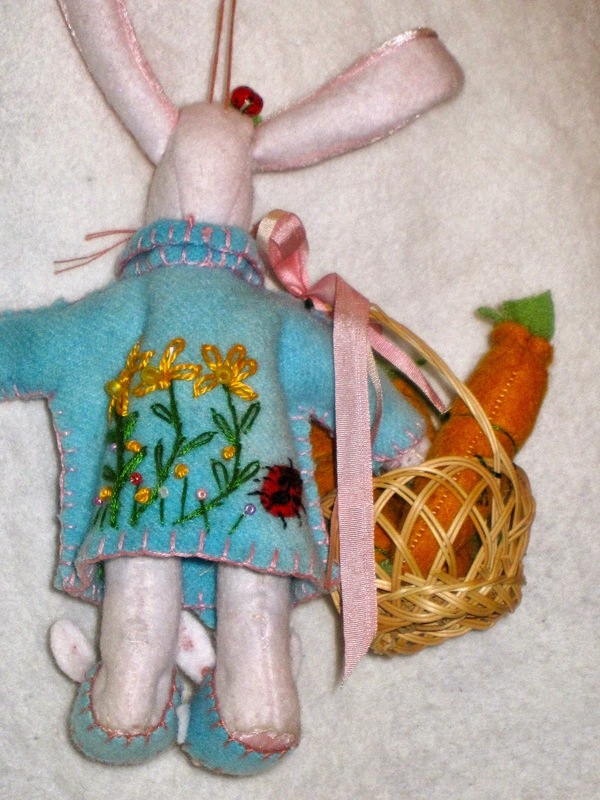 I had fun making this wee bunny and she has become very dear. I wanted to make her some bunny slippers and I love the way they turned out. I added embroidery details all over her sky blue coat. She is ready for the winter market. 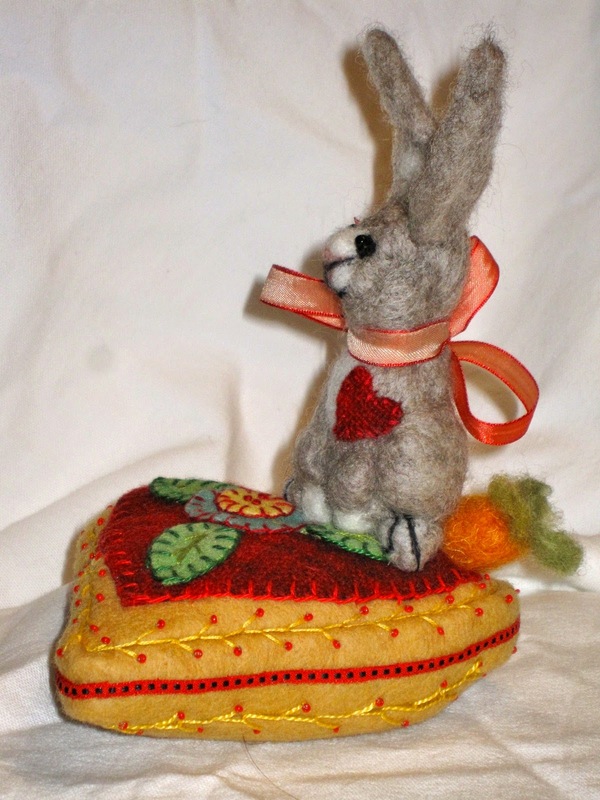 Like many other sewers, I never seem to have enough pincushions so I love, love making them. They are small, use different fabrics, are prime for embellishments and are the perfect cushions for wee felted animals (which I love to make as well). 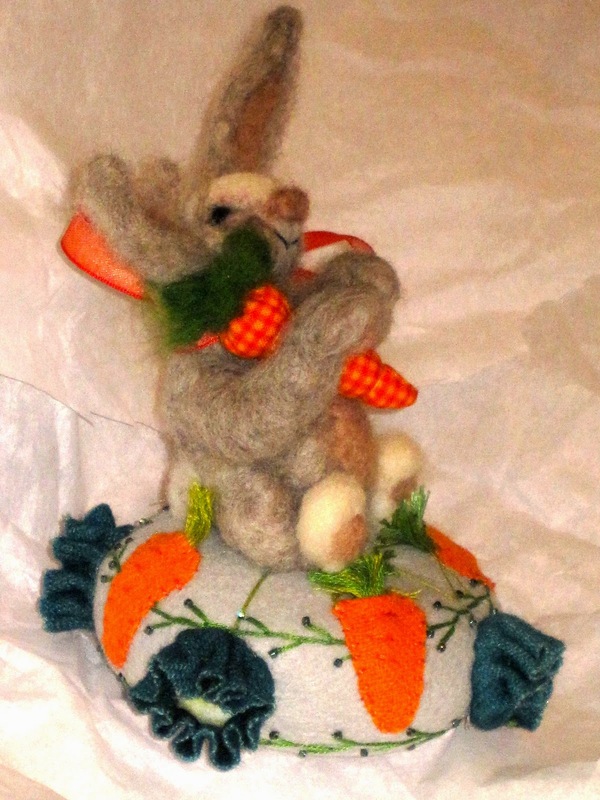 Both bunnies are needle felted using Perendale silver wool fibre. 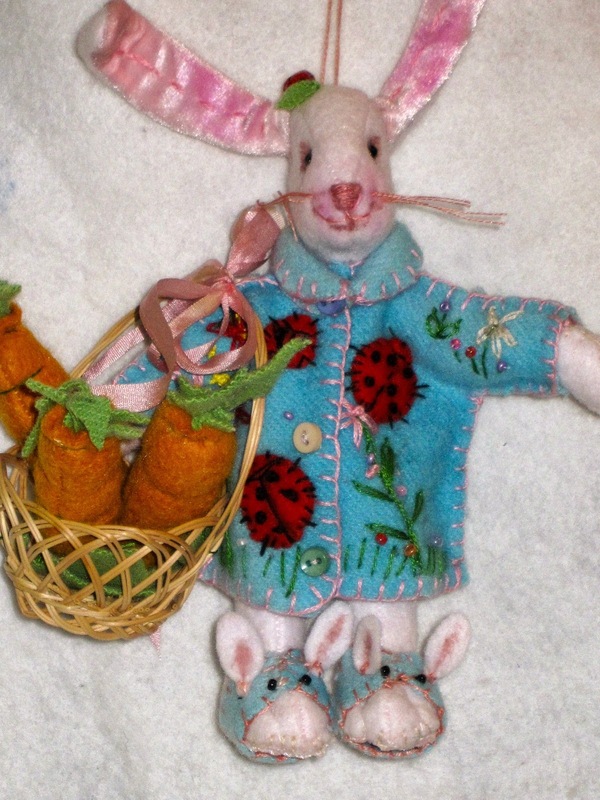 Needle felting is fun. Felting needles (I use the number 38 star needle) are mostly in a triangular shape. The smaller the number the larger the needle and the larger the hole it will leave. The felting needle had little barbs on the sides that catch the scales on the wool fibres and lock them together. As you poke through the wool, it shrinks up and felts together in the direction that you poke the needle. 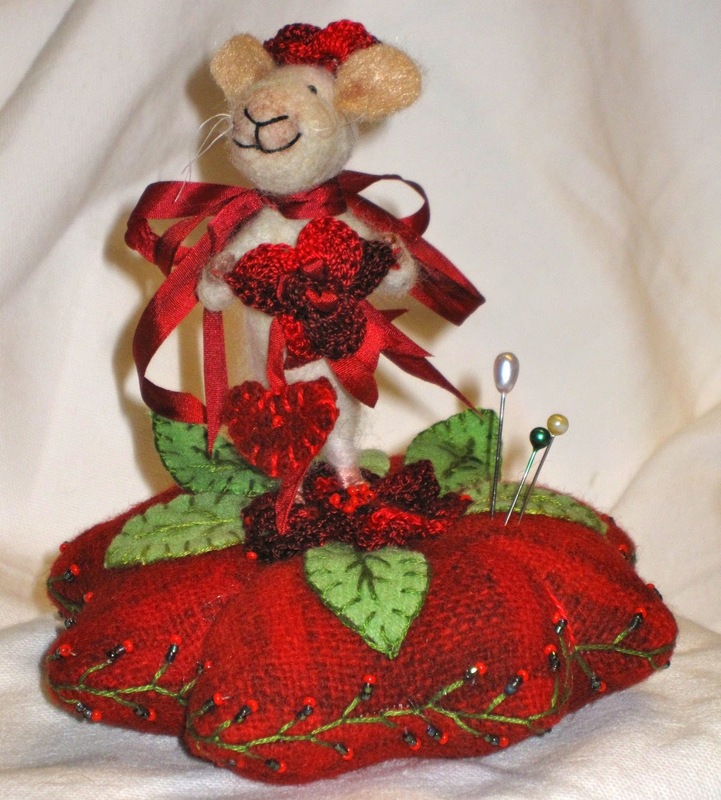 Now I turned my attention to the mice: This is the first one that I am calling "Hearts and Flowers". 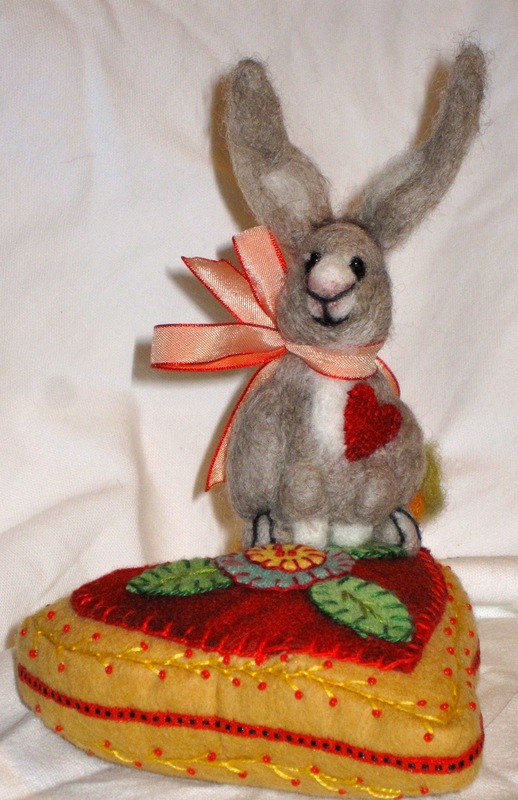 The heart is made of 4 felt wool hearts sewn together with wool hand-crocheted flowers and wool felt leaves. 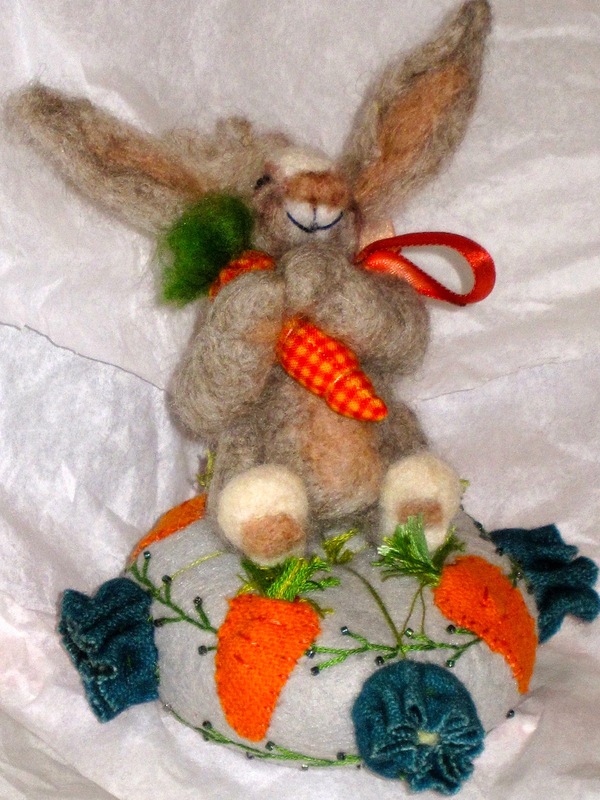 This little guy is only 3 and 1/2 inches tall and needle felted around a pipe cleaner centre core. 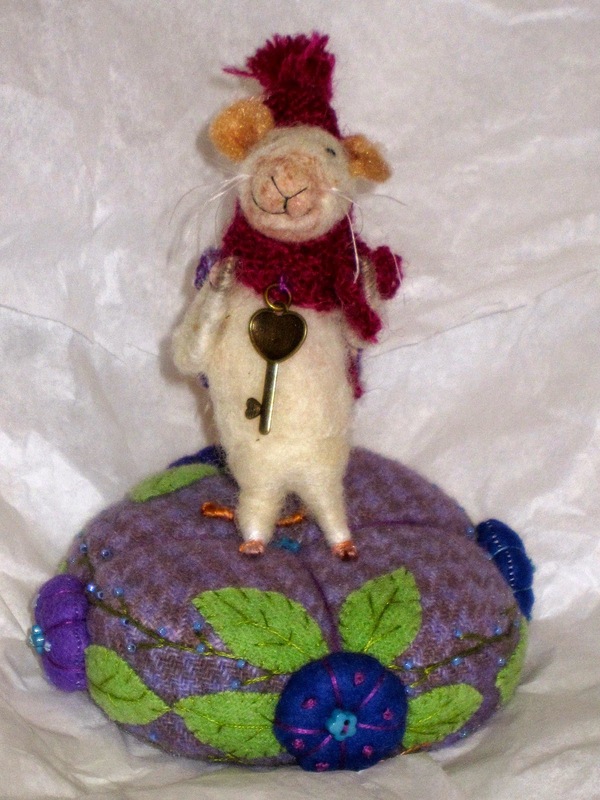 The final wee mouse pincushion is my favourite and I made it for a dear friend who also loves wee felted mice: He has a hand knitted scarf and hat and a key around his neck that says "love". I made him a wee backpack that holds extra yarn. Good-bye little fellow, I know my friend will love you too!